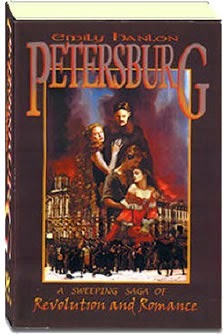 I was on Amazon today and thought, for the fun of it, to look up my novel, Petersburg. It is an historical novel set against the Russian Revolution of 1905. Under reviews by readers, this is what I found. This is perhaps the best book I have ever read. It is a major accomplishment and I'm amazed that it hasn't received tons of literary awards. Hanlon's use of dialogue along with the flow and rhythm of the writing is just outstanding. Never before have I had such a clear sense of living in this historic time. Hopefully this book won't be lost in obscurity. It would make such an incredible movie. I found this book a total thrill from start to finish and was totally gutted when it came to and end. I took myself there and lived the book, which had the most unpredictable story lines and characters you couldn't stop yourself loving or hating. I could almost feel the snow crunching beneath my feet. This novel had everything, I simply could not put it down. I can only hope and pray that one day it will make it to the big screens, it would be magnificent. At the center of the tumult is Alexei Kalinin, a self-made railroad tycoon who is fighting to overthrow the monoarchy. Alexei is in love with Anna Orlov, a gifted young pianist whose connection to Alexei will thrust her into the bloody events as they unfold. Alexei's pacifist nephew Misha escapes his abusive father only to land in the middle of the violence. And Misha's tutor, the proud and sensuous Irina Rantzau, renounces her aristocratic background to stand up for her revolutionary ideas. I found Petersburg to be a real page turner. I was completely hooked by the plot, couldn't figure out what was coming next, fell totally in love with the characters whom I found breathtakingly real! I felt as if I was really in turn of the century Russia and as an afficionado of Russian history, I was impressed with the historical accuracy of the major events. The love stories were passionate and moving and the scenes of revolution bounced off the page. If you like historical fiction, this is a real winner. I recently read Petersburg- and after working with Emily for over a year. Why was I waiting? I think scared I might not like it. Well, I need not have feared. It was a damn good read. I stayed up very late to read it and had that bittersweet sense of loss when I reached the last page and wished I was just beginning it. Ever notice how some novels look like the author is writing with the intention of having his book turned into a movie?